3x0 Swing the ball back and forward around the perimeter. 3 players, 1 ball 2 pylons. 1 in the corner with the ball. 2 and 3 in the guard positions. 1 passes the ball to 2, and cuts to the other corner. 1 passes back to 3. 1 cuts back through the bucket. The ball is swung back to the other side. After1 catches the ball he shoots. After the shot, 3 cuts to the basket for the offensive rebound. To start the drill again. First catch by 1, stable and watching the passer no look at basket. Pass between cutter and 2 very fast. 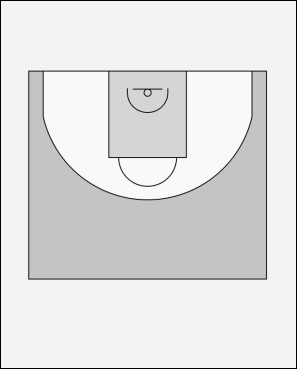 Second catch by 1, in release position (to basket) for the fast shot. Play until a fixed number of shots are made or how many shots in x minutes.